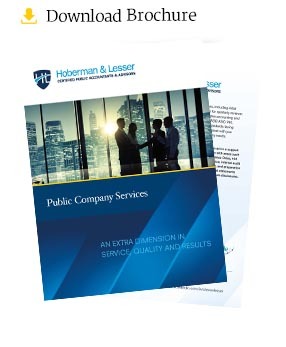 At Hoberman & Lesser, LLP, we understand the ongoing challenges that the executives, directors, and audit committees of public companies must address as they navigate an ever-changing and unpredictable regulatory environment. The financial reporting of public companies is under significant scrutiny from both regulators and investors while the accounting and internal control guidelines have increased in complexity. It is essential for public companies to work with experienced accountants and advisors who can help them address those challenges and provide cost-effective services and solutions. Hoberman & Lesser, LLP, is registered with the Public Company Accounting Oversight Board (PCAOB) and for more than 30 years, we have been providing audit, tax, and advisory services to public companies. Our dedicated professionals are experienced in SEC rules and regulations, and we remain current on the increasingly complex auditing and reporting requirements. Our ability to consistently deliver a combination of high-level industry expertise and personalized client service of the highest quality has earned Hoberman & Lesser a reputation as an attractive alternative to national and larger firms. Whether performing quarterly reviews, annual audits, specialized services or liaising with regulators, our clients rely on our technical expertise and innovative insight combined with thorough execution, quick response, and diligent follow-up. Our professionals work directly with our clients’ audit committee and management team to develop an efficient audit plan and a detailed schedule of all key dates, deadlines, and filing requirements. Our streamlined, accessible organizational structure allows us to mobilize quickly ensuring flexibility, versatility and responsiveness as we satisfy our public company clients’ changing requirements. We provide an objective and independent perspective and utilize a risk-based and collaborative approach that is customized for our clients’ unique needs. Hoberman & Lesser successfully fulfills the independence-driven needs of public companies by serving as a complementary provider of non-audit advisory services, including tax planning, compliance tax provision work, Sarbanes-Oxley compliance, and business valuations. We also often act as an extension of a public company’s internal team. Our senior level technical professionals can resolve complex issues, such as revenue recognition; stock compensation; purchase accounting; or goodwill impairment.